Uses IIS to set up a secure web site that allows you to make content available to all your Microsoft Dynamics AX 2012 users, without having to install a .chm file on each client computer. Allows you to use the existing Help content as a starting point and modify or add custom content to suit your specific business situation or practices. Provides more options for searching for our Help content on the web. How does the help server work? From an AX client, a user presses F1 or the help button, the client will send a ping to the AOS asking “Where is the help service located?”. The AOS responds with the URL for the help service on the help server. Then the client starts to open the help viewer.The help viewer needs something to display so the help viewer requests the topic id from the help server. The help server, if the topic is local, searches for the topic with the specified ID, retrieves the HTML file with the topic ID, grabs the labels from the AOS and adds them to the file. If it’s a web based topic, then it returns the URL. 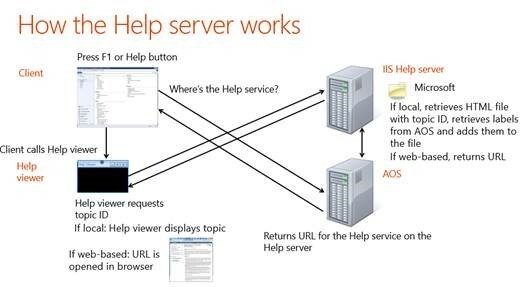 As the final step, the help server sends the information back to the help viewer. If it’s a local topic, the help viewer will display the topic and if it’s a web-based topic, the URL is opened in the browser. Why would you want to customize the help server? You can control what users see when they look in Microsoft Dynamics AX for help by clicking the ‘?’ or typing F1. You can create your own documentation for the Help system. You can also hide documentation from other publishers. Users can easily find your documentation by using the table of contents and Search, and you can provide the custom keywords that enable Search to work well. It’s easy to integrate your own documentation along with the Microsoft Dynamics AX documentation. Publishing documentation is as simple as copying the files to a folder. The system consists of a Help Viewer (which is a customized Web browser), a Help Server (which is a specialized instance of IIS), and a search service (which is just Windows Server Search). You have two options for creating original documentation:use the provided Microsoft Word template or directly edit some existing HTML.You can also add to the table of contents that users see in the Help Viewer to show your own documentation. You can find more information about customizing the help server here and templates that you can use to customize can be found here.